Indian Land, SC housing market (29707 zip code) update for March 2019. The Indian Land housing market remains a seller’s market with 3 months supply of inventory overall, but with just 2 months supply of resale homes. 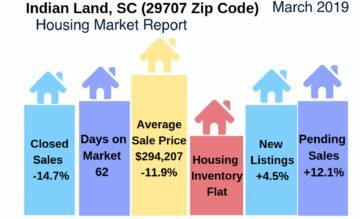 Although the average sale price of Indian Land homes dropped in March 2019, it shouldn’t be assumed Indian Land homes are losing value. 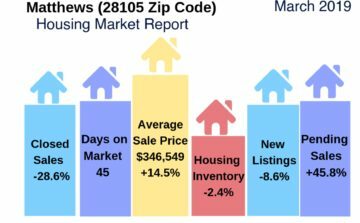 It had more to do with the price mix of homes sold. 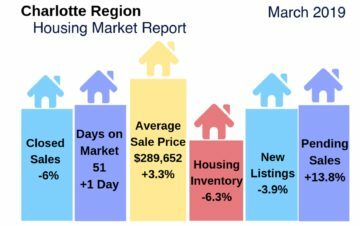 And the median price of homes sold increased by almost 6%. New construction homes sold at about $53,000 more on average than resale homes. 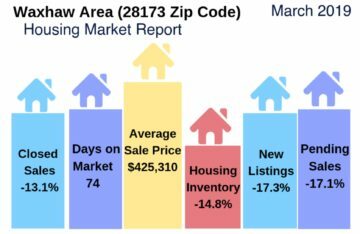 The drop in closed and pending sales is to some degree a result of lack of inventory — inventory of resale homes dropped 22.4% compared with the same month on year ago.